22 Inch Akoya White pearls, 7-7.5 mm, perfectly round and high luster. The clasp is solid 14 karat yellow or white gold. This 22 Inch. strand of white AA+ pearls Unbelievably brilliant! Akoya pearls size is 7-7.5 mm with beautiful orient. 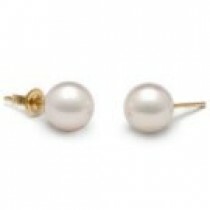 The pearls are clasped together with a solid 14 karat gold clasp (white or yellow gold) and individually knotted with twin silk. The 7-7.5 mm size is the most popular and best-selling Japanese Akoya pearl size. Akoya white pearls are available in different overtones: Silver, Rose or Ivory. Make your choice using the Option Menu. Choose pearl quality: AA+ or AAA. While the AA+ Akoya pearls are very lustrous and have light blemishes, the AAA Akoya pearls exhibit a slightly higher luster and even cleaner surface. You have the choice between Yellow and White gold. Think about purchasing at the same time a pair of earrings, we'll be able to match pearl overtone perfectly on all the pearl set!